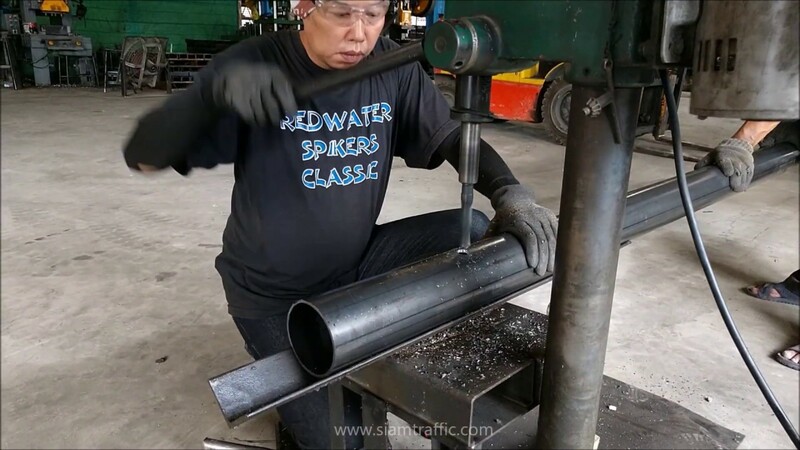 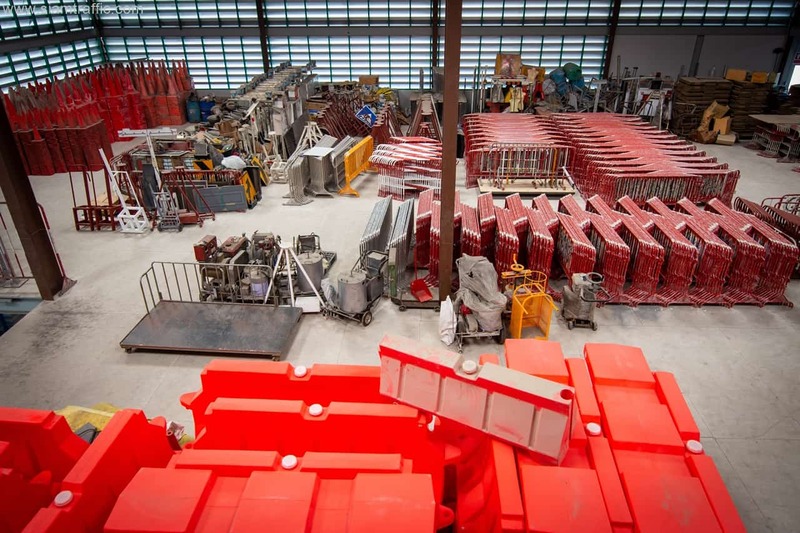 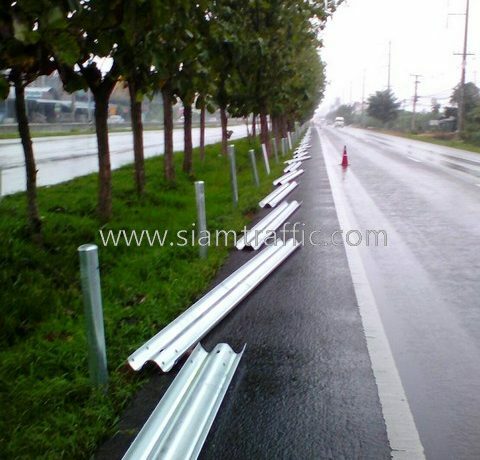 Guardrail is processed by method of Basic Oxygen Open Heat Electric Furnace, the galvanized steel sheet is long lasting and extremely resists to erosion. 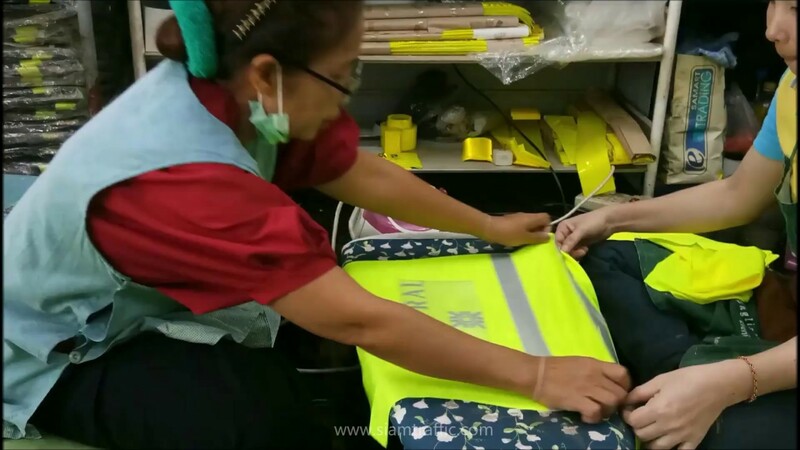 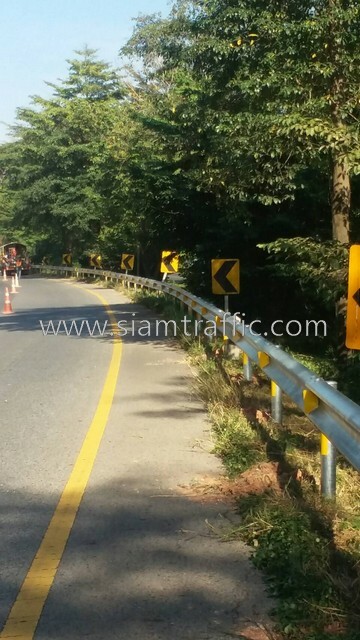 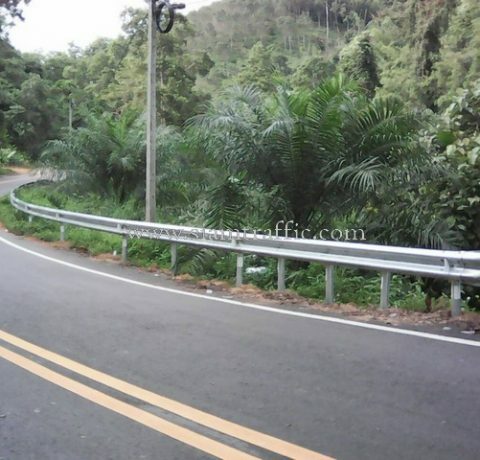 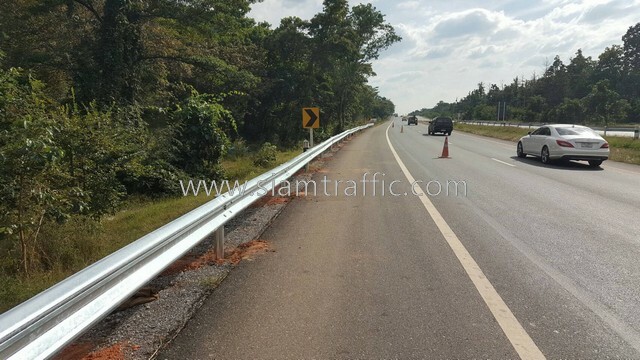 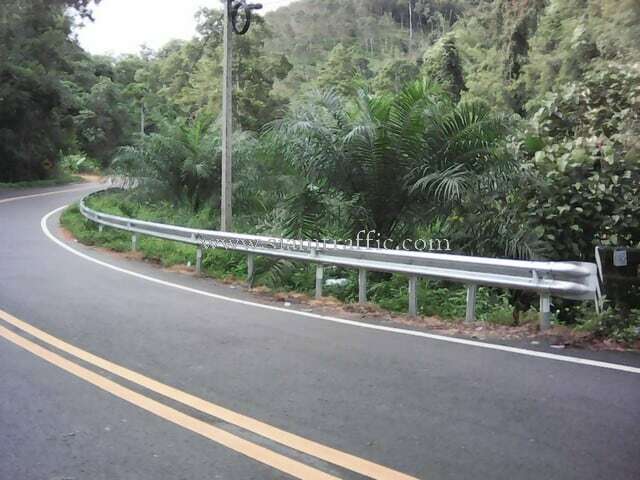 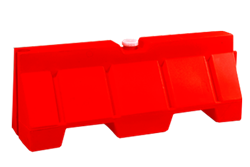 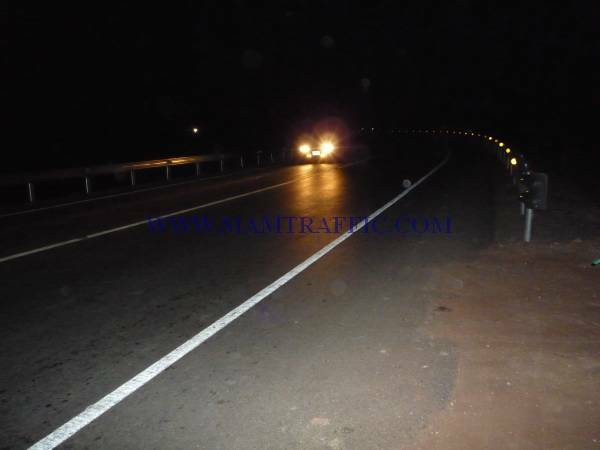 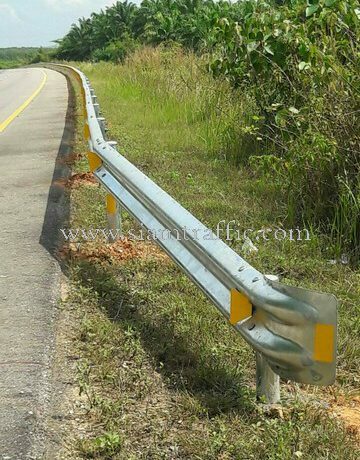 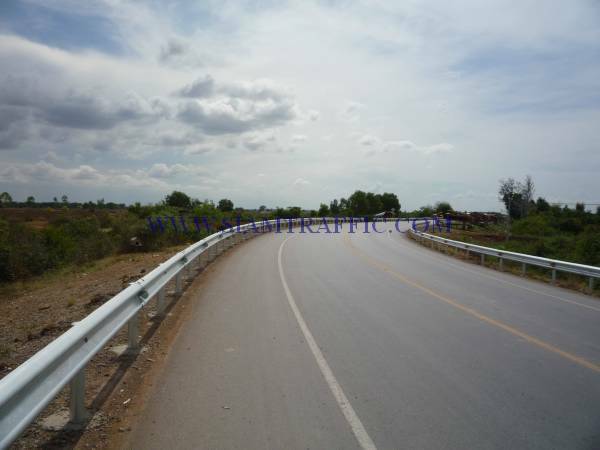 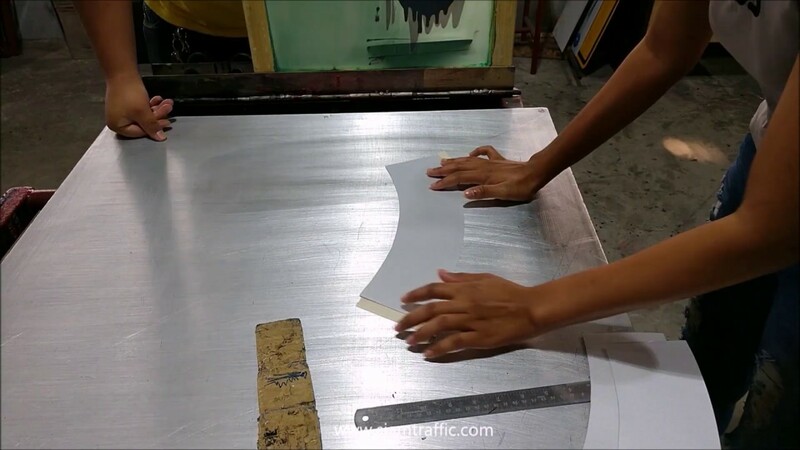 Guard rail is generally mounted along sharp curve to prevent an accident.Guard rail is classified in two class which is class 1 : The guard rail thickness is not less than 3.2 mm. 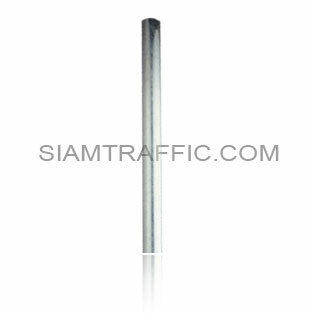 class 2 : The guard rail thickness is not less than 2.5 mm. 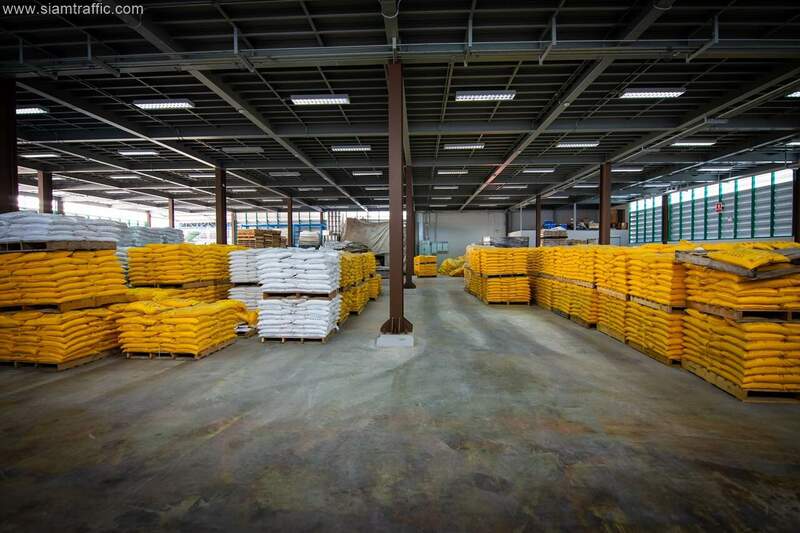 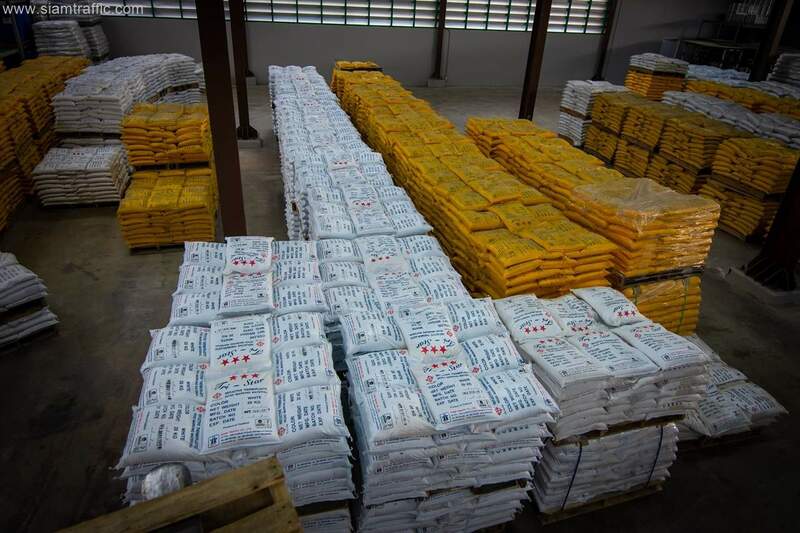 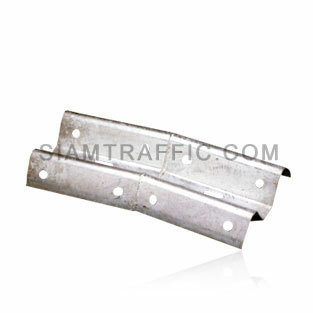 Also divided in two type which are type 1 : coat zinc is at least 550 gm/sq./mm. 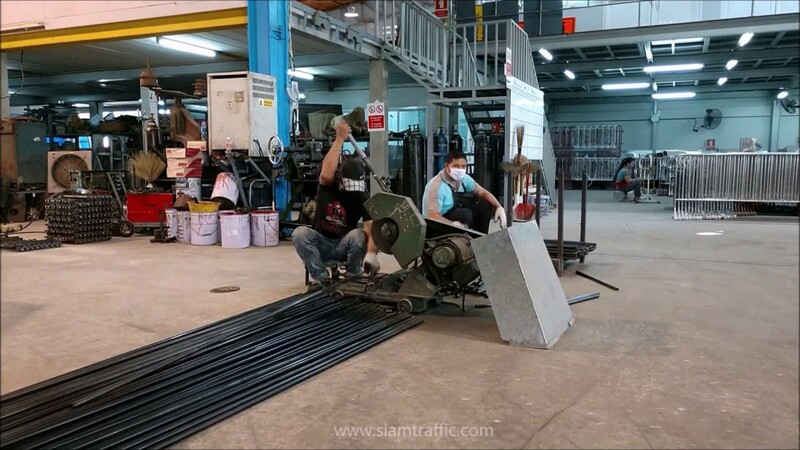 by hot dip method. 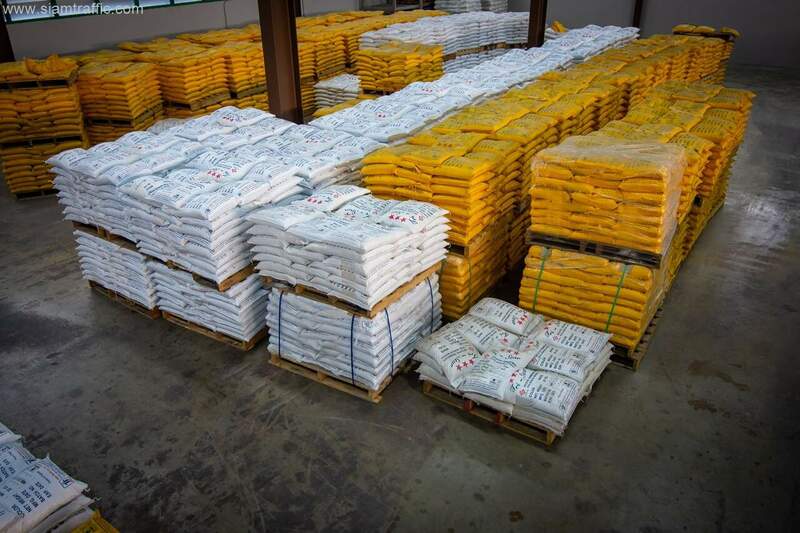 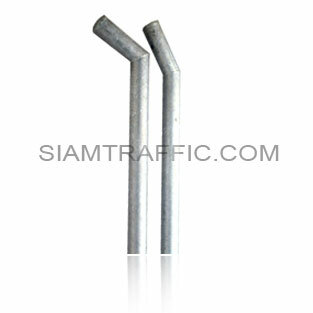 type 2 : coat zinc is at least 1100 gm./sq./mm. 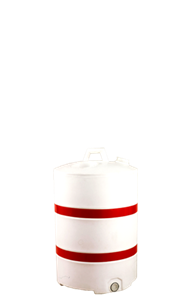 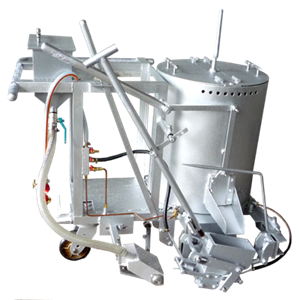 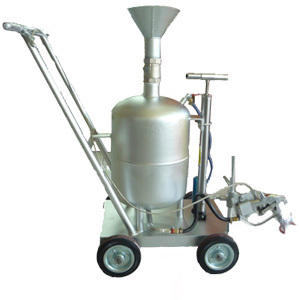 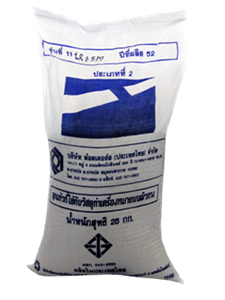 by hot dip method (for using nearly sea and high corrosion area). 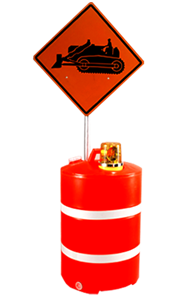 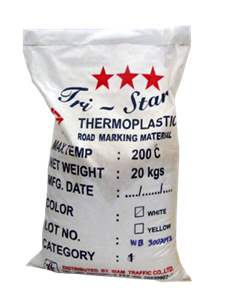 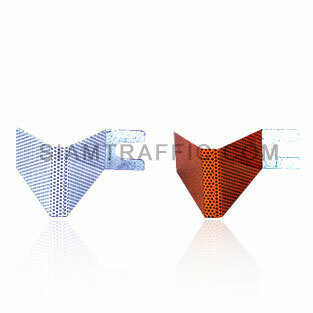 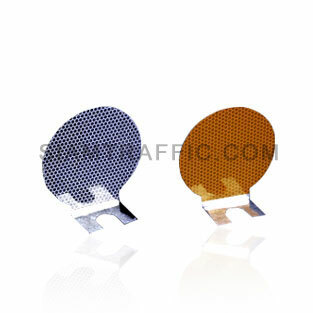 We also provide reflective adhesion materials on guard rial for optional. 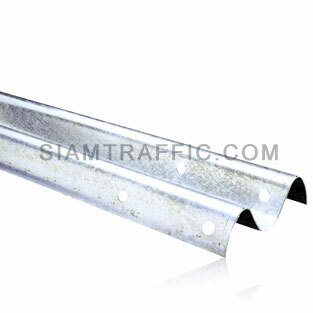 W Beam guard rail : thickness 2.5 mm., and 3.2 mm., length 1, 2, 3 and 4 meters. 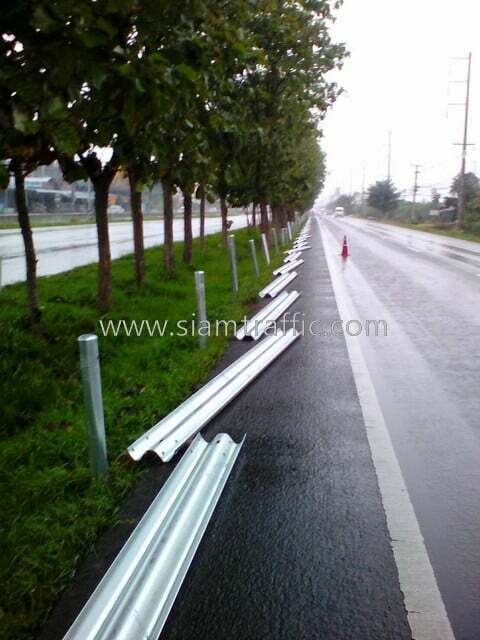 W Beam flare end wing. 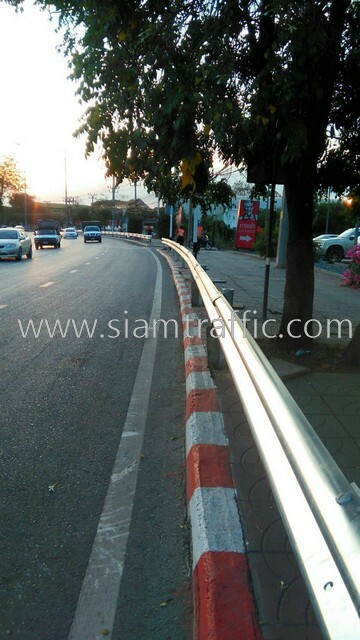 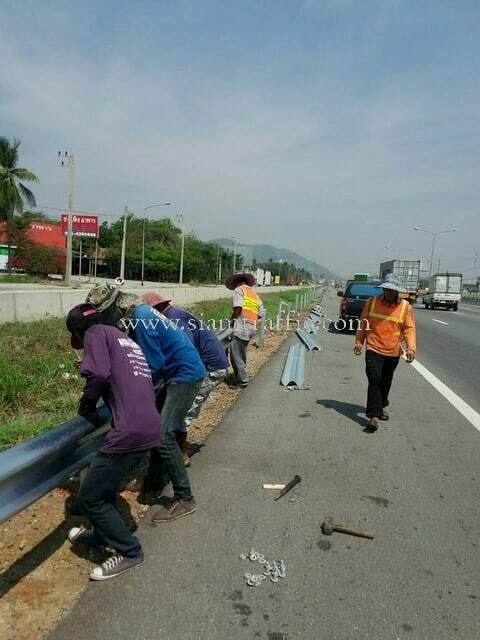 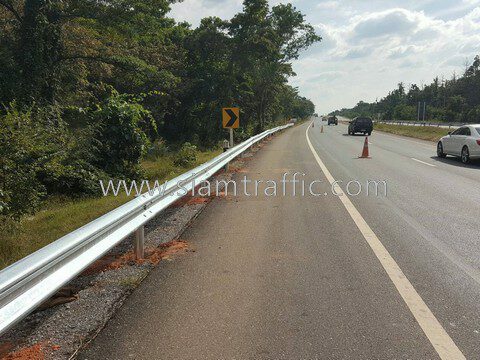 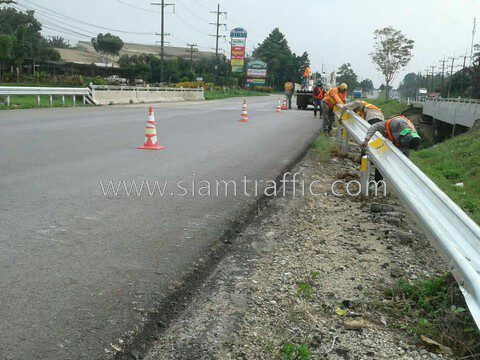 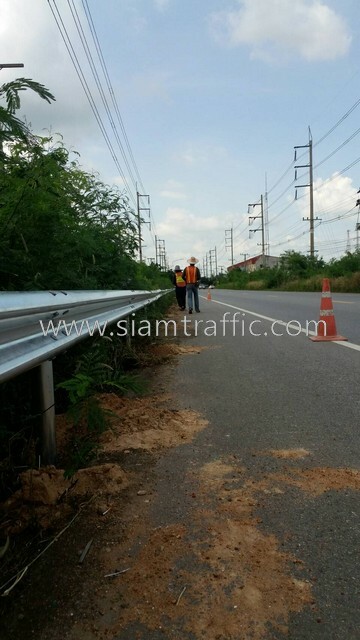 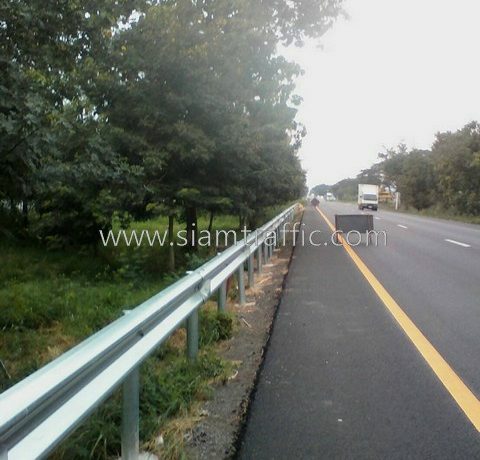 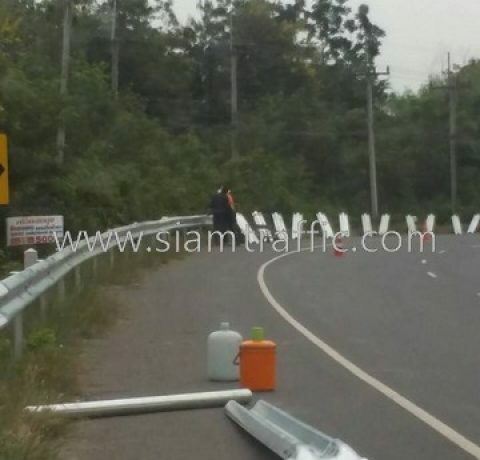 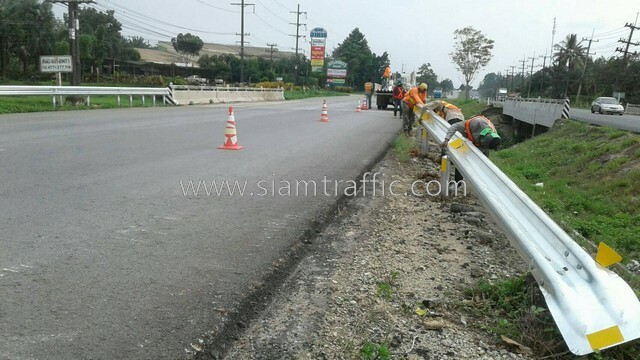 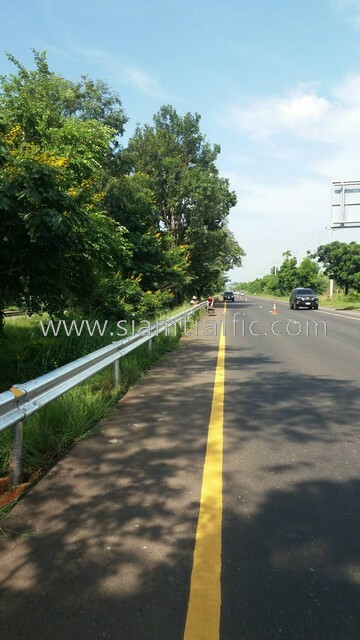 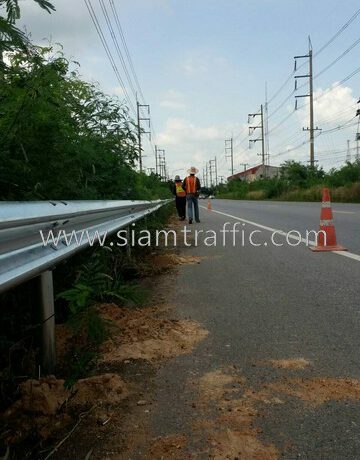 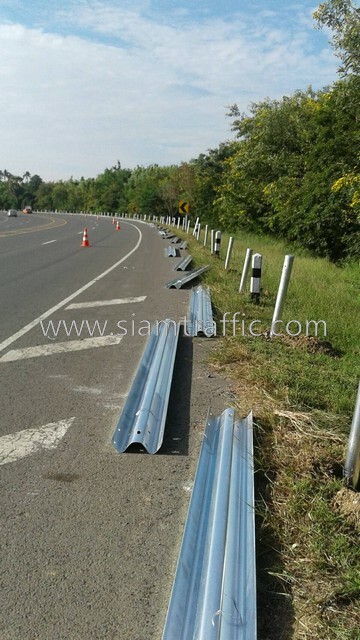 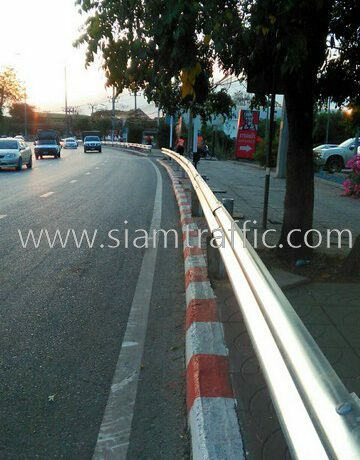 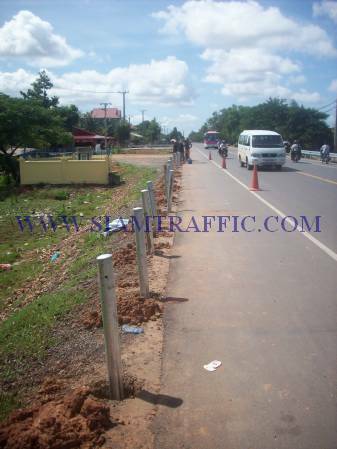 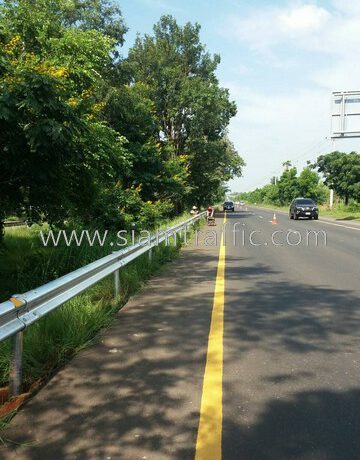 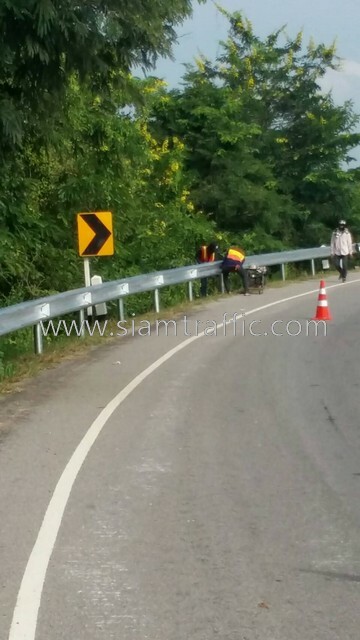 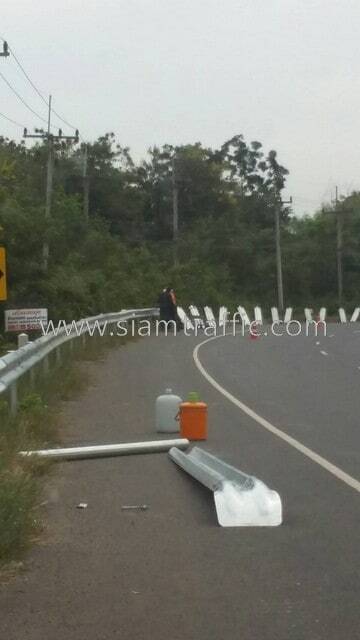 Straight guard rail post (height 2 meters). 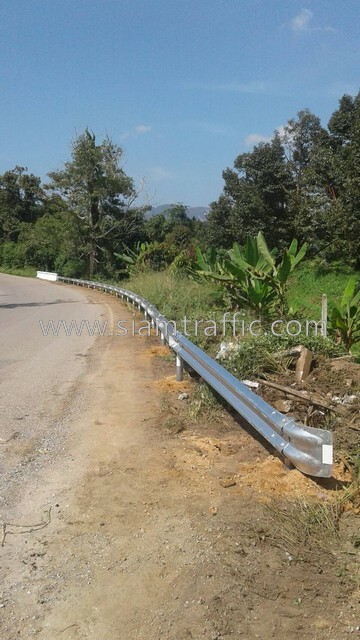 Guard rail post with 30 degree askew end. 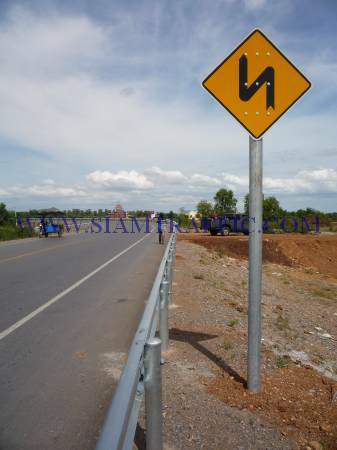 Guard rail post with 60 degree askew end. 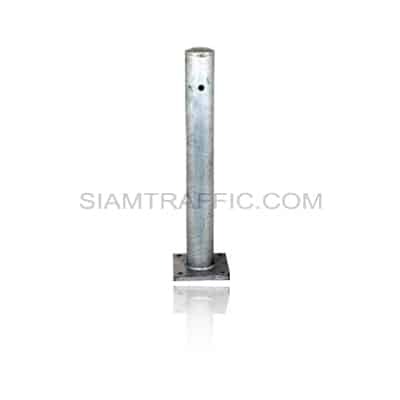 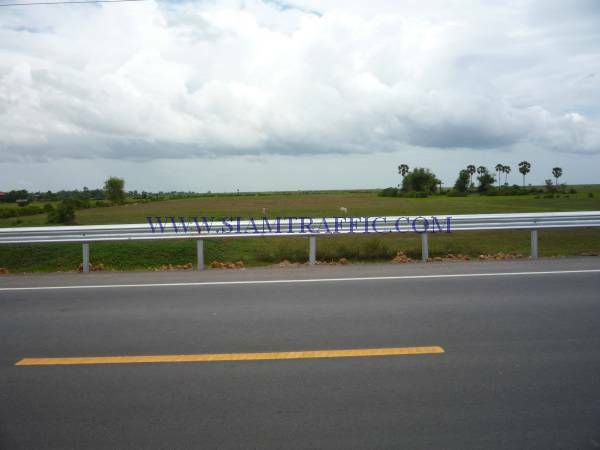 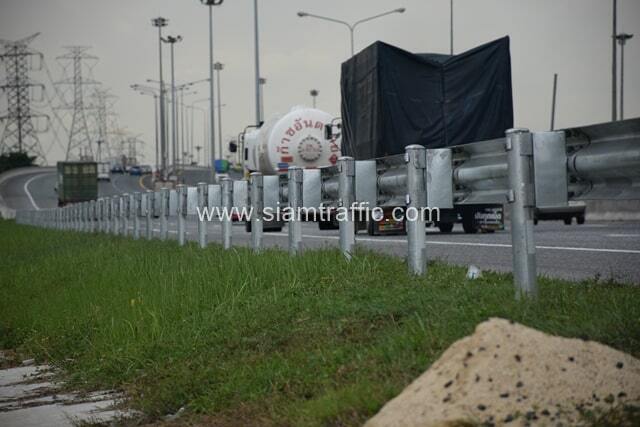 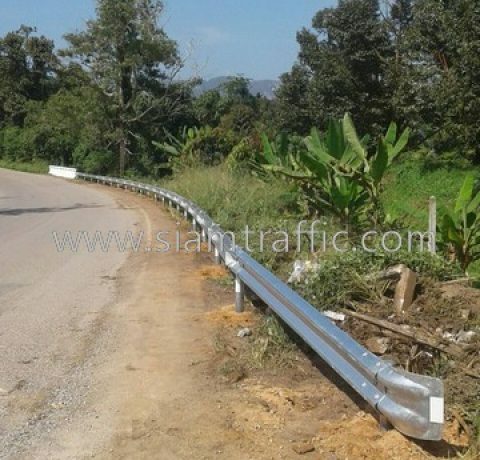 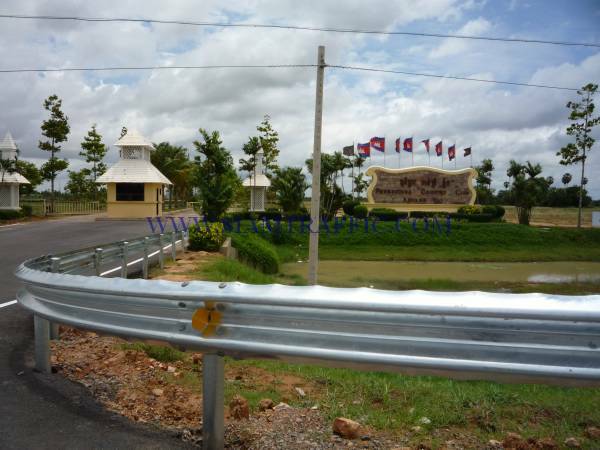 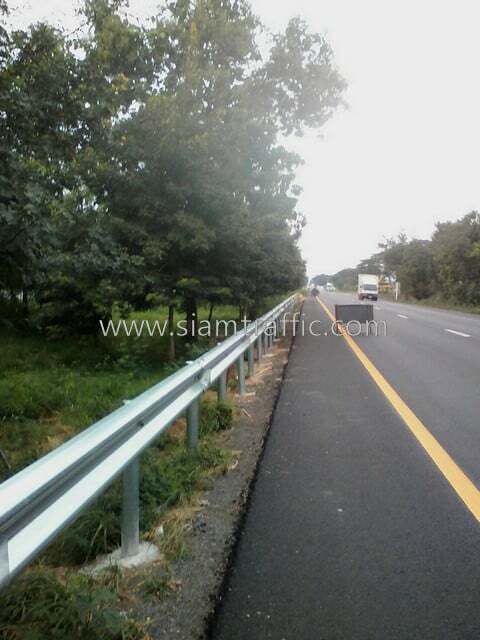 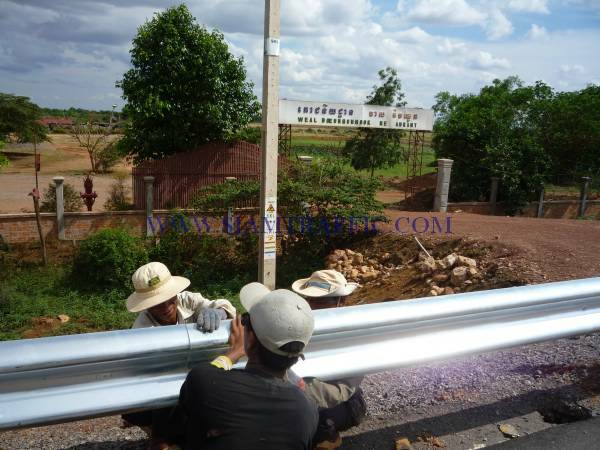 Guard rail post welded to steel plate (height can be customized per your project). 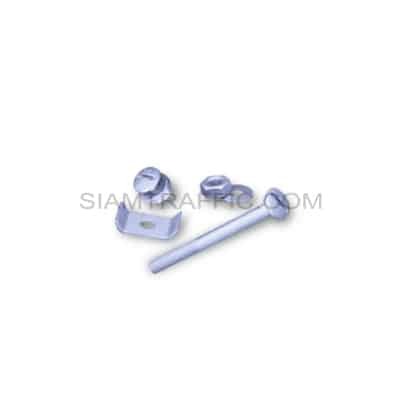 Screws or bolts and nuts. 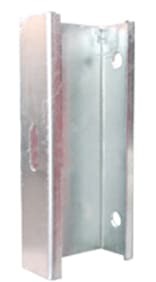 Long screws or long bolts and nuts. 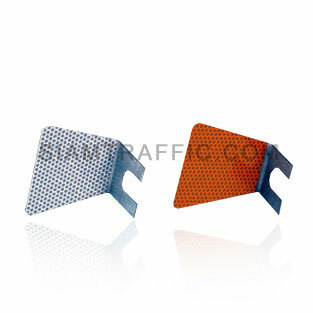 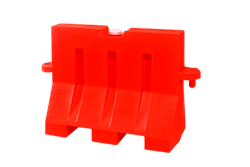 Trapezia guard rail delineator, one sided, White (GR01), Yellow (GR02). 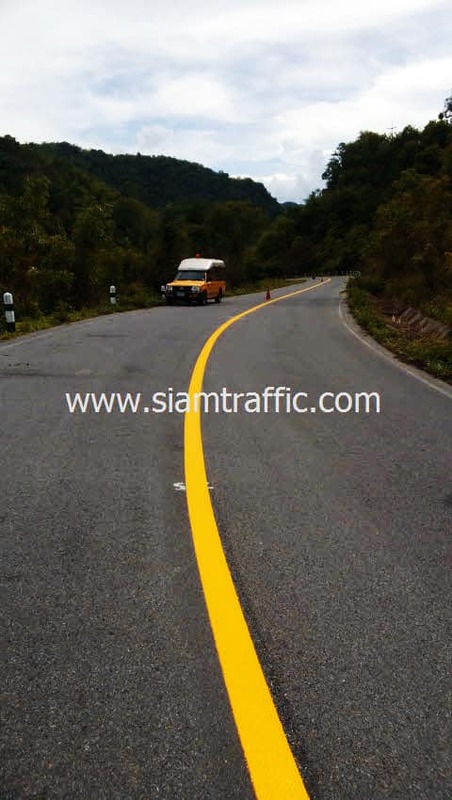 Trapezia guard rail delineator, two sided, White (GR03), Yellow (GR04). 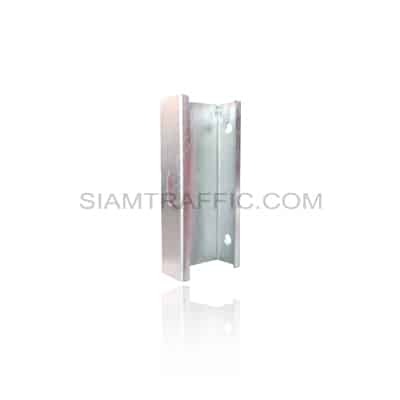 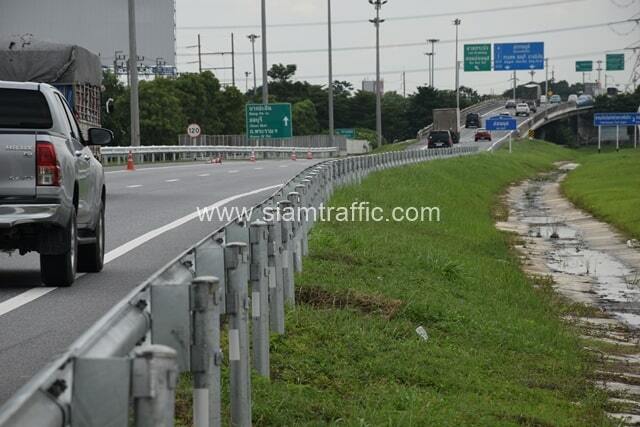 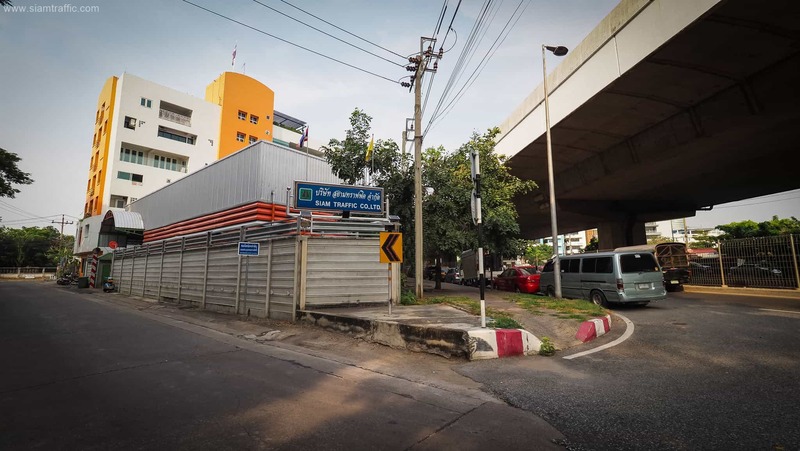 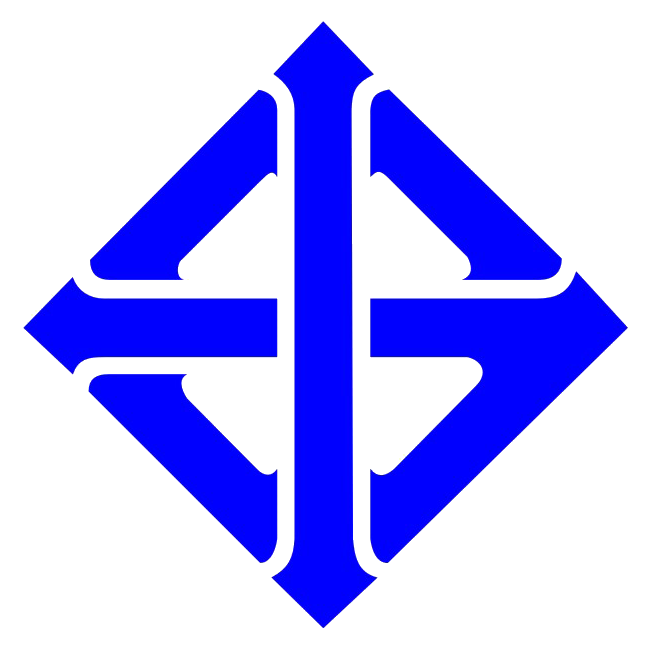 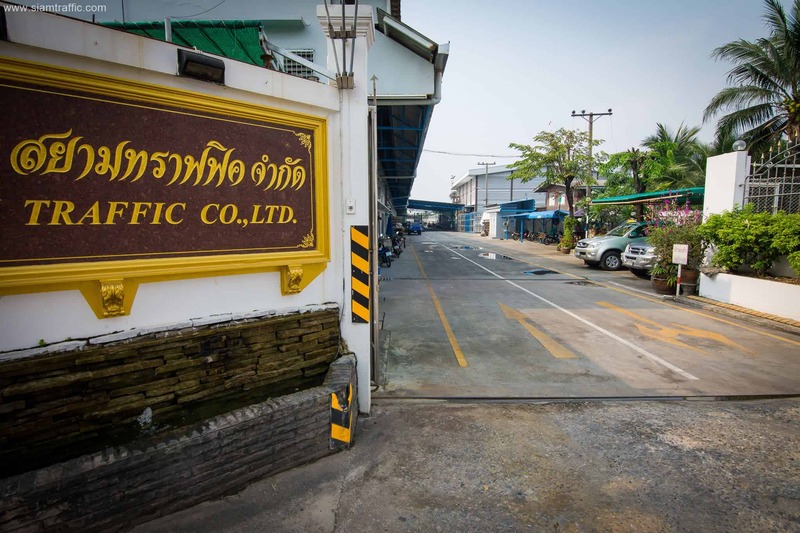 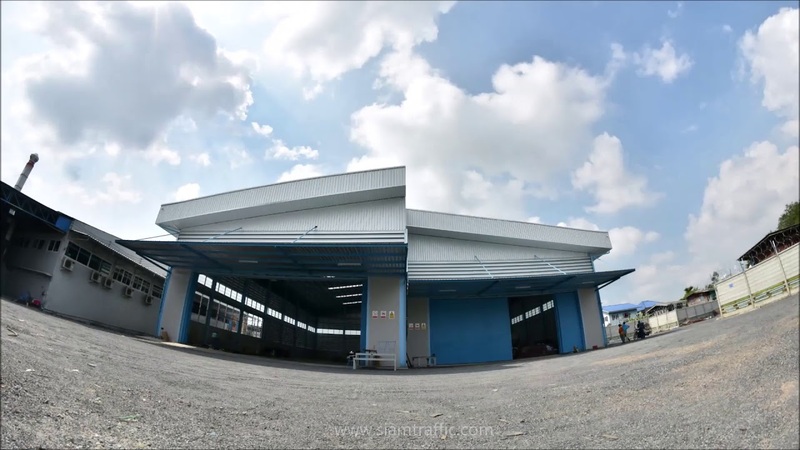 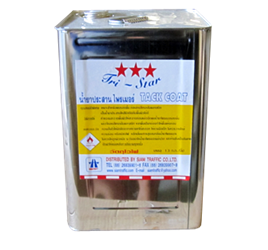 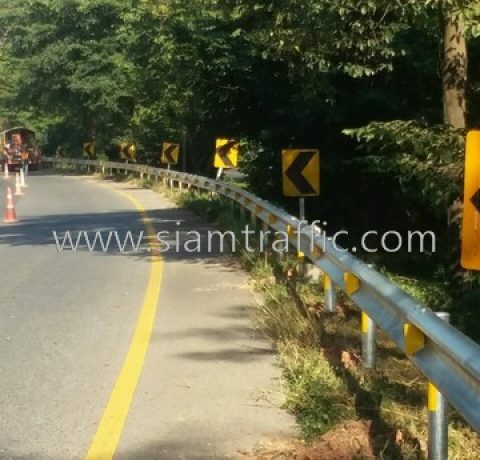 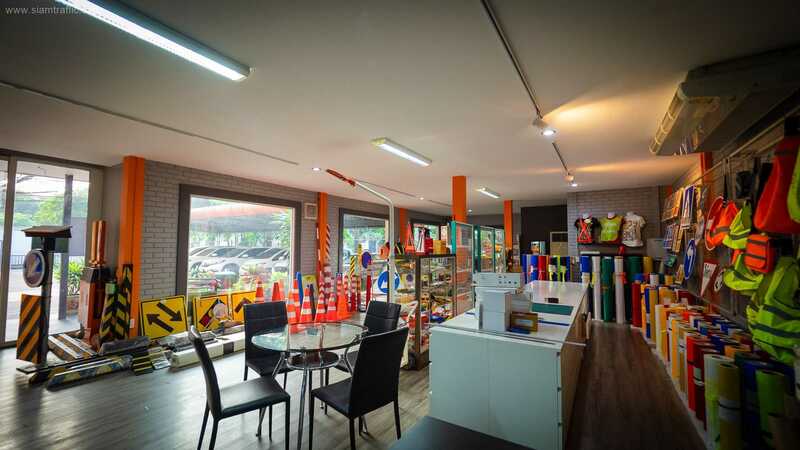 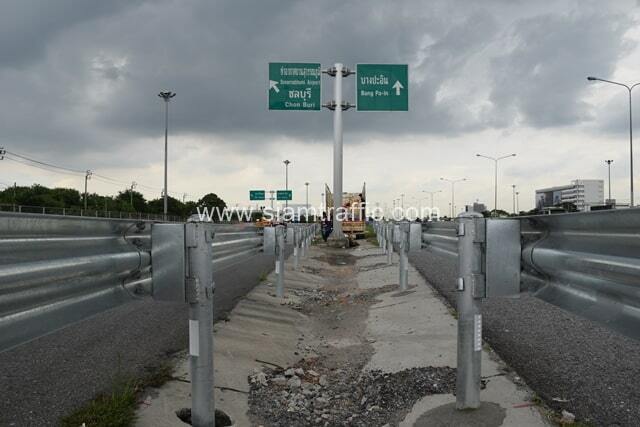 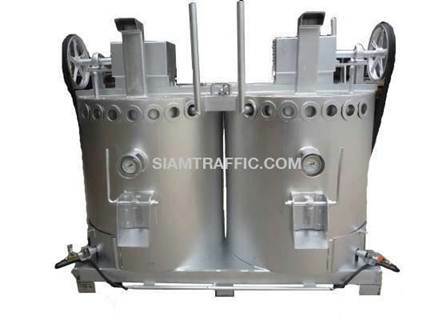 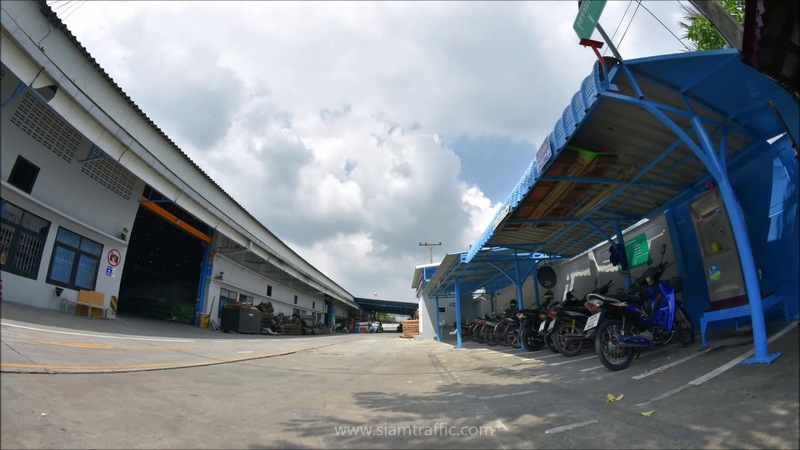 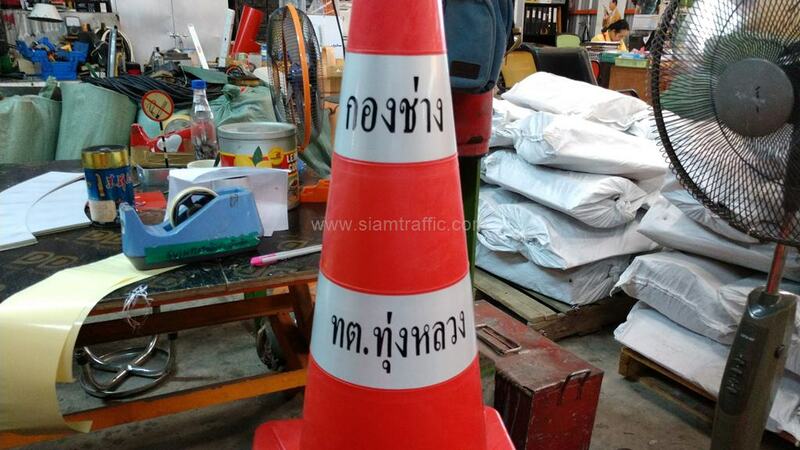 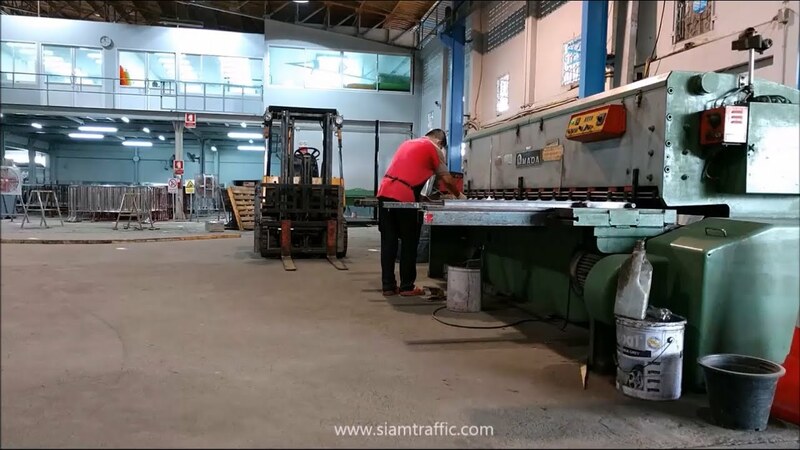 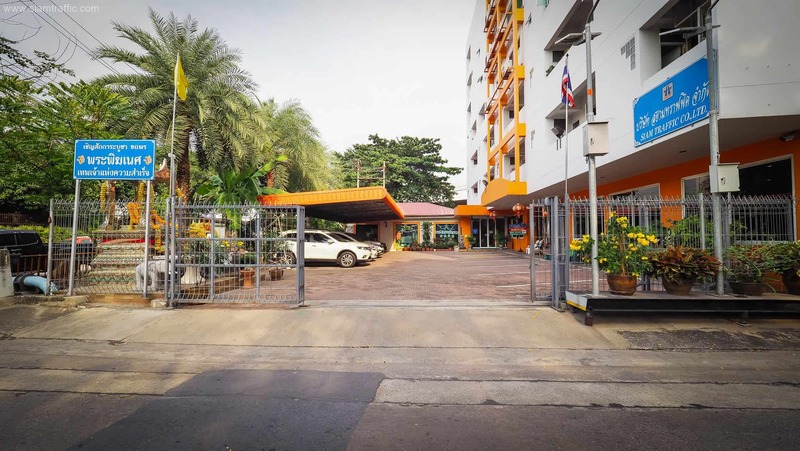 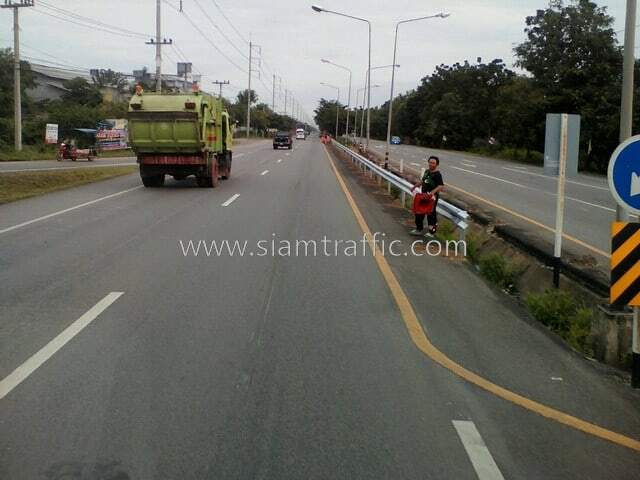 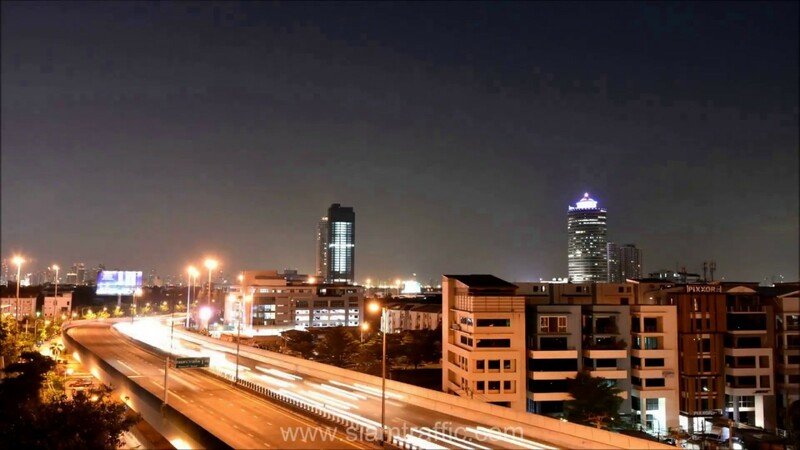 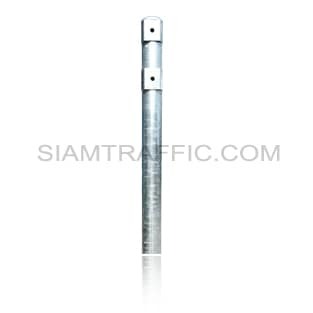 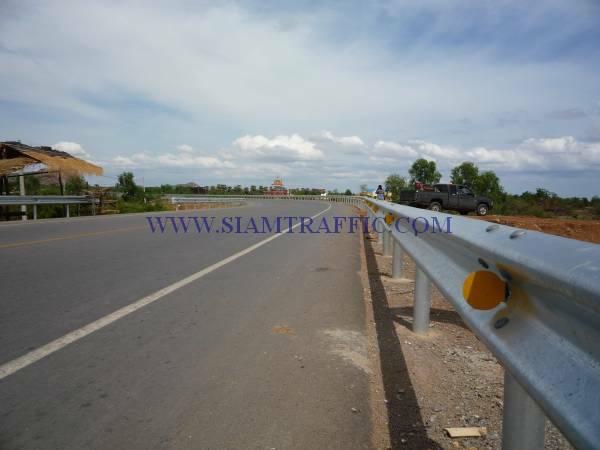 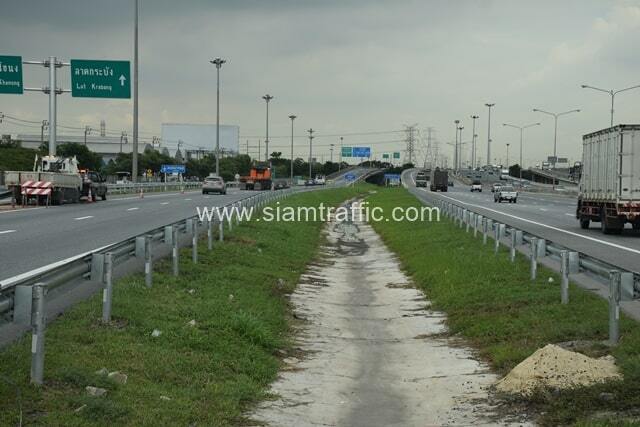 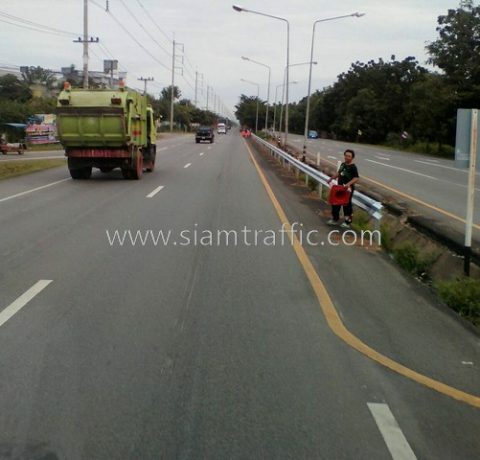 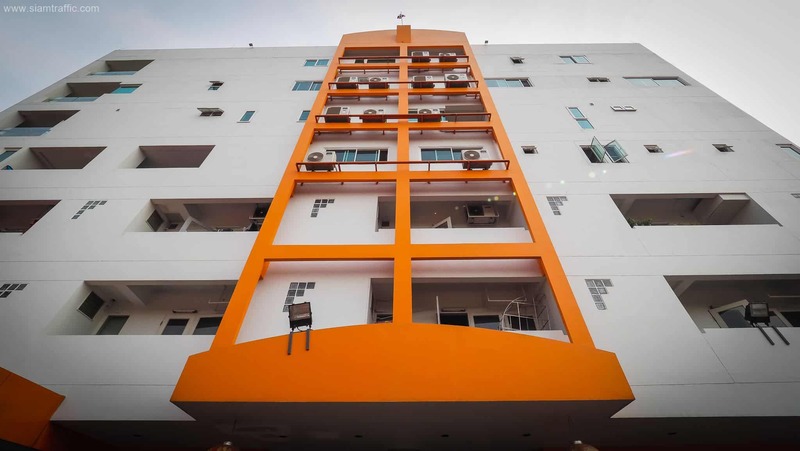 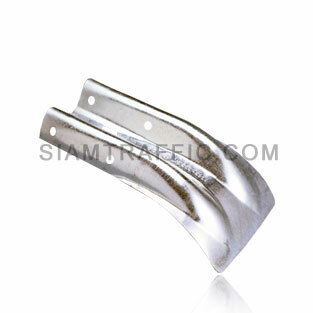 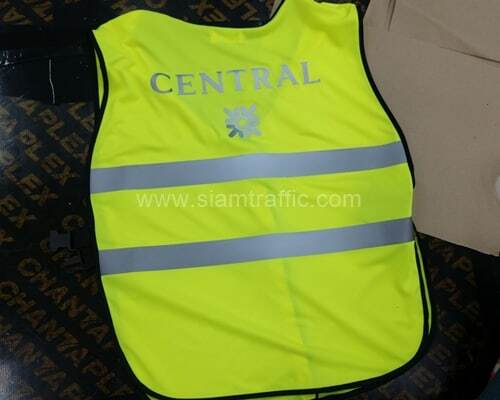 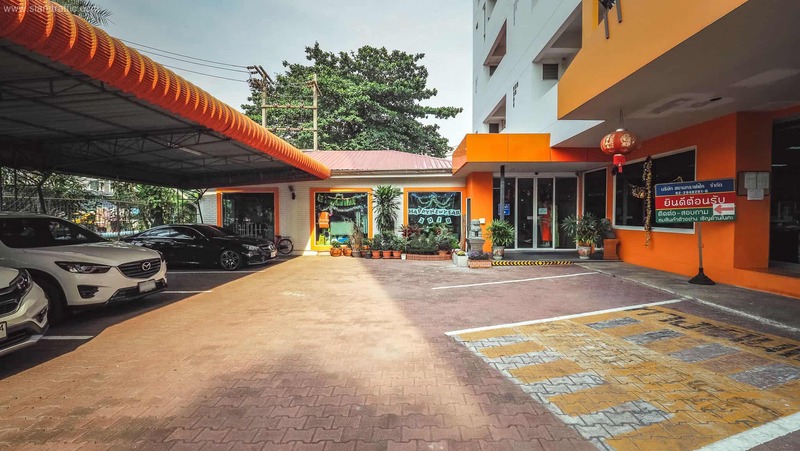 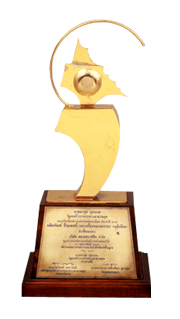 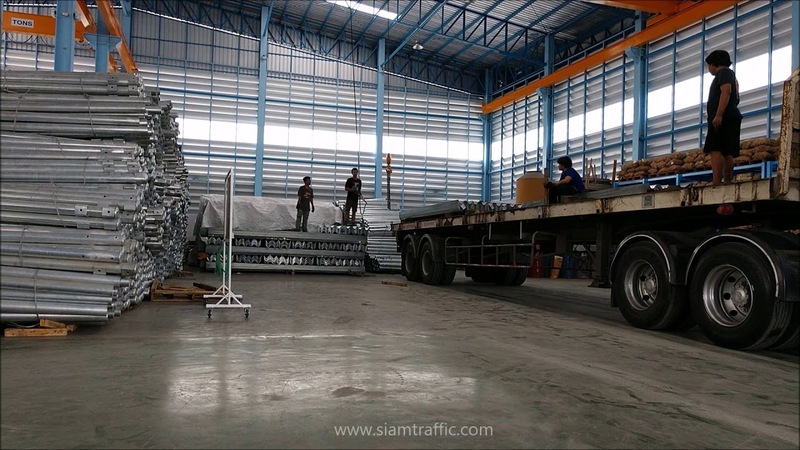 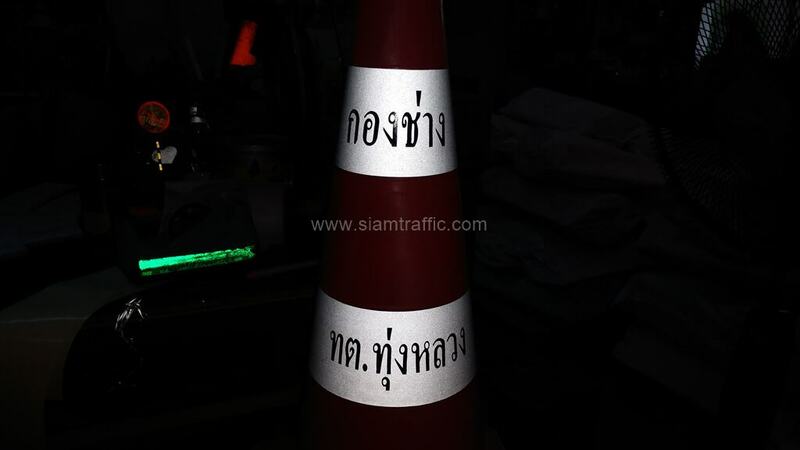 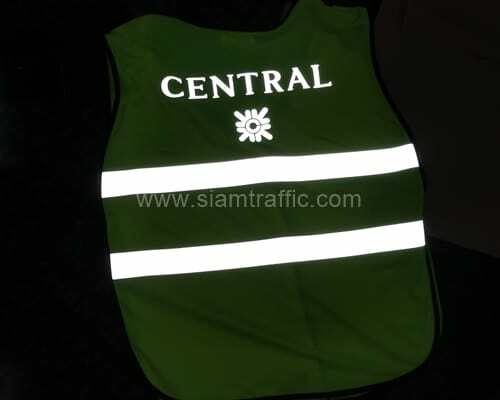 Siam Traffic Co.,Ltd. 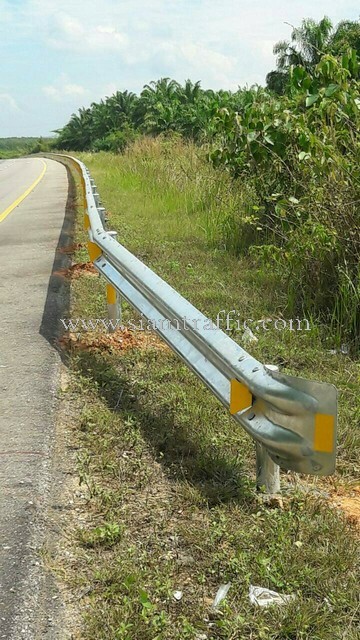 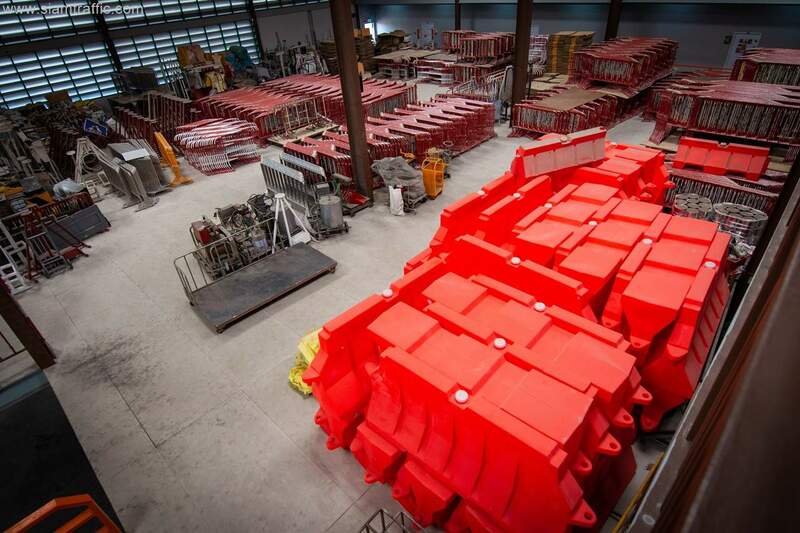 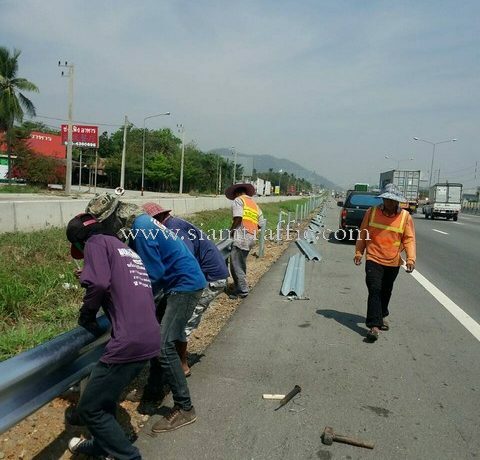 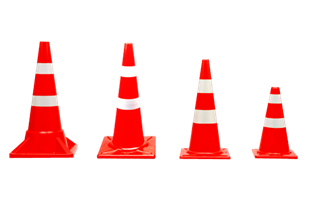 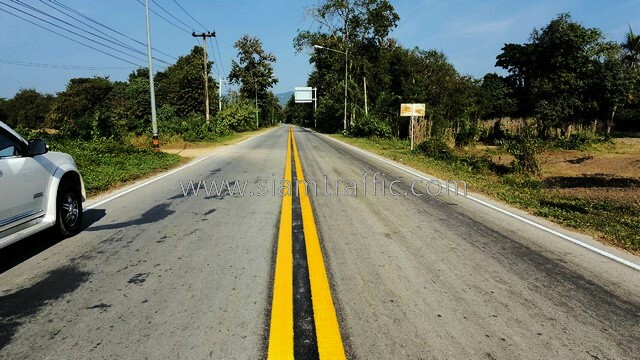 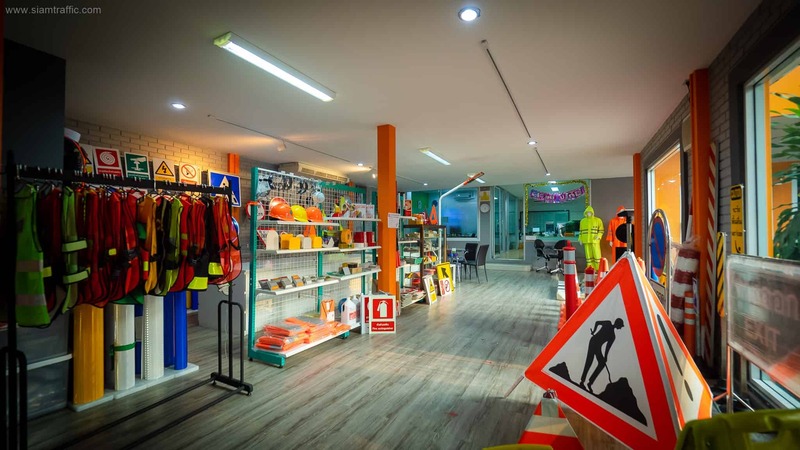 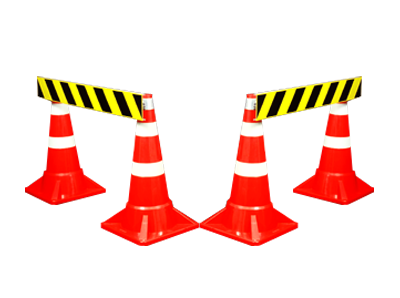 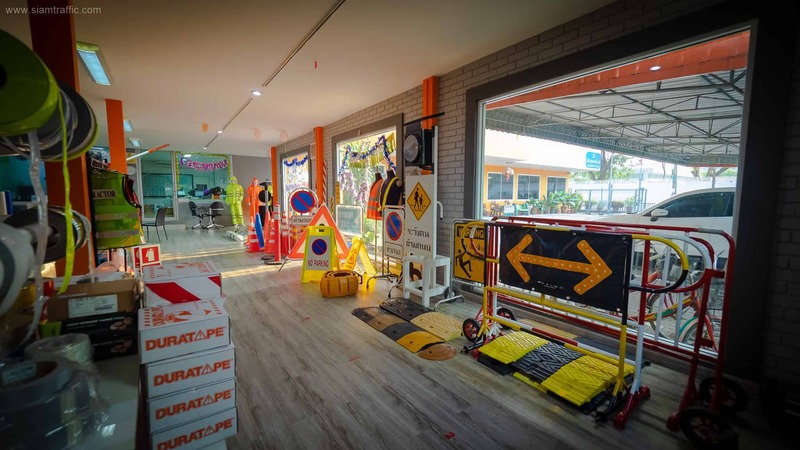 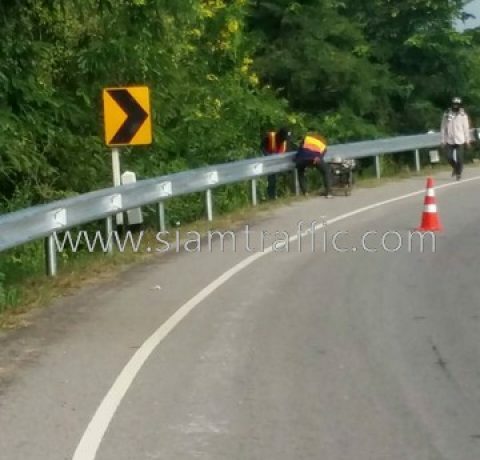 has a team of experts with over 30 years experience of proven records in guard rail installation, which matches the standard of Department of Highways and Department of Rural Roads. 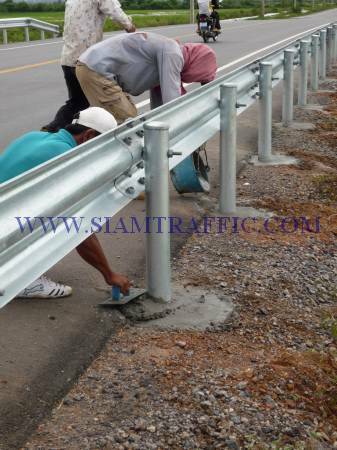 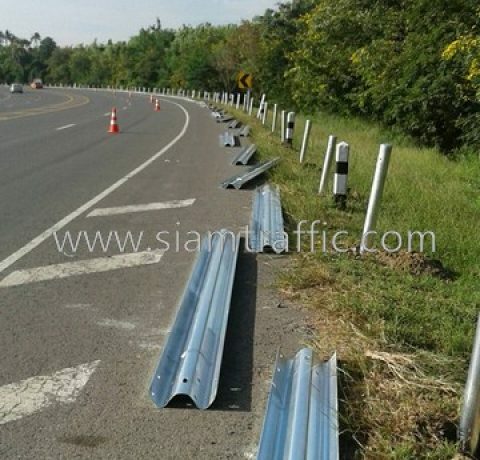 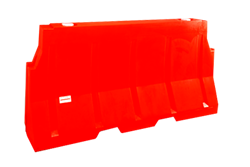 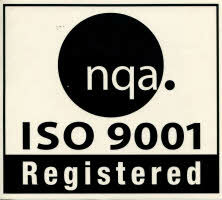 For more information in guard rail installation, please contact us. 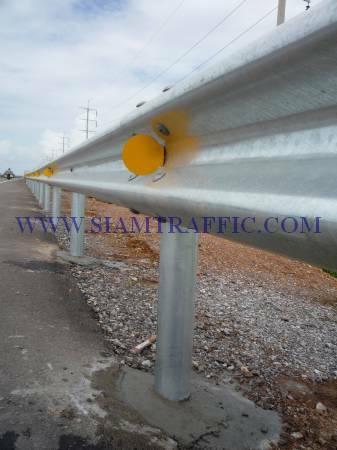 *Please fill number of guard rail(meter) and amount of open range. 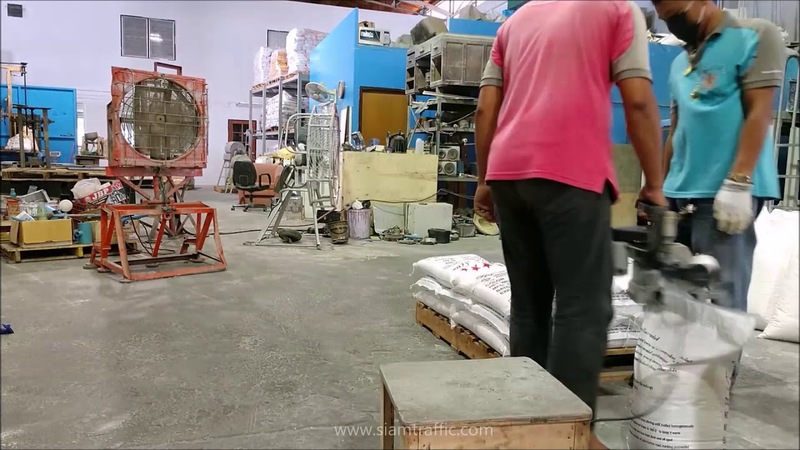 Click at calculate button. 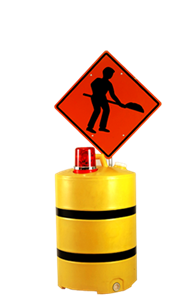 The Department of Highways standards. 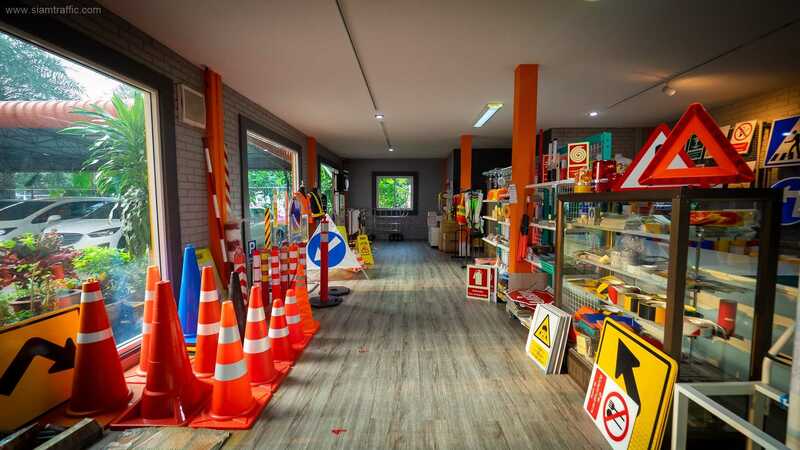 The Department of Rural Roads standards.